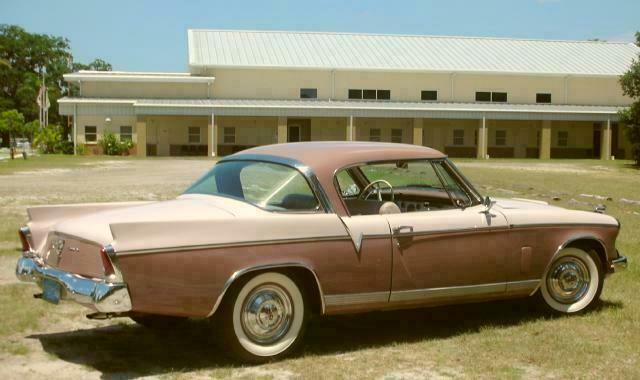 This beautiful 1956 Studebaker Golden Hawk Hardtop belongs to Bill Ladroga currently of Sarasota, Florida. He is the third owner of the car. Bill relates that the original owner was from Colorado Springs, Colorado and that he kept the car for over thirty years. 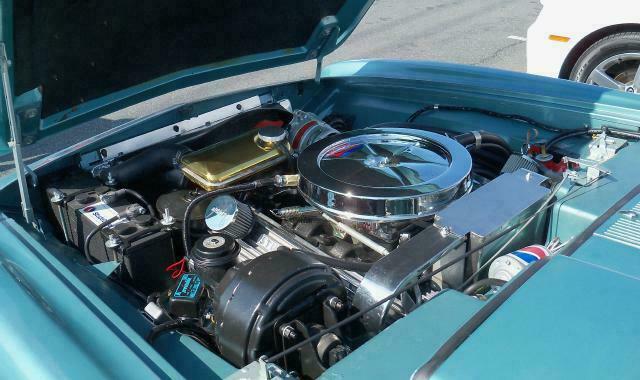 The car had a dealer-installed continental kit on it that the original owner's wife wanted. The original owner estimates that he put more than 200,000 miles on the car since he and his wife often visited relatives in Texas. The original owner also told Bill that the Packard 352 V8 engine "went bad" at 9,000 miles and Studebaker replaced it with a new service engine. Here is an old picture with the continental kit taken on it the day it arrived at Bill's home in Massachusetts from Colorado. When Bill bought the car in 1995 it was painted Mocha and Snowcap White. Bill decided to repaint it Mocha and Doeskin after seeing Frank Ambrogio's 1956 Golden Hawk. He liked that combination and the car needed some body work and a repaint. To complete the project Bill ordered a complete factory authentic Rose Mist vinyl interior from Phantom Auto Works. All of the restoration work was done in 1995 and both the paint and the interior have stood the test of time. Bill has endeavored to keep the car factory authentic, conceding only to wider Mopar rims, modern radial tires, an electric fuel pump, and an electric radiator fan to cope with the hot Florida weather. Bill's Hawk is equipped with the optional Packard Ultramatic automatic transmission, power steering, power brakes, factory manual AM radio, and tinted glass. 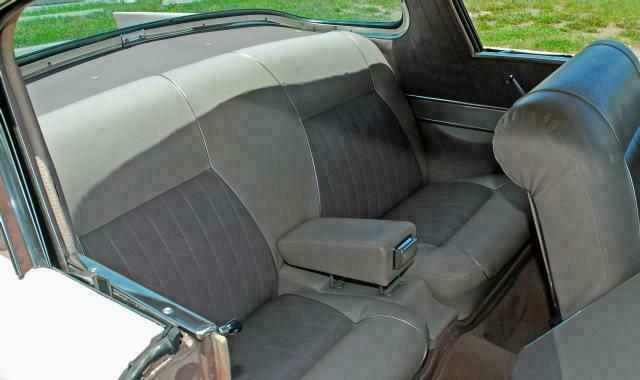 It also has the unusual and correct optional seat belts with the outside belt attached to the front doors. 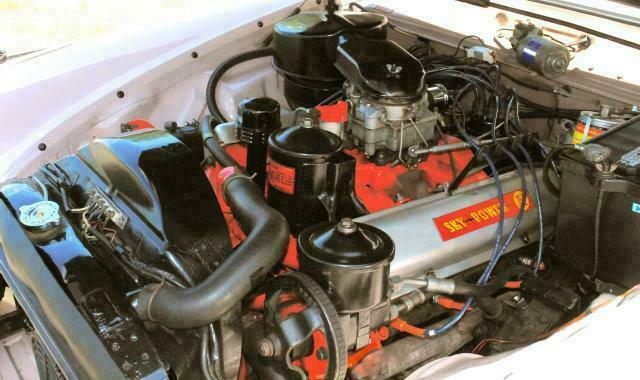 The Packard 352 V8 engine was rated at 275 horsepower and a four-barrel carburetor and dual exhausts were standard. Total production of 1956 Golden Hawks was 4,071 of which perhaps 500 remain. 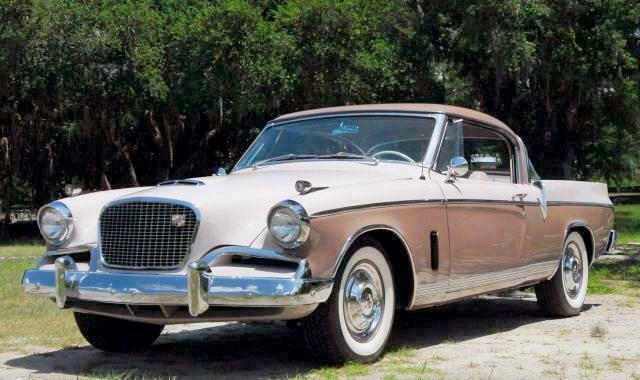 The 1956 Golden Hawk is unique in that it was the only Studebaker model of any year to use a Packard engine. Thanks to Bill for sending the pictures and information about his outstanding Golden Hawk. If you own or once owned a Studebaker or related vehicle and would like to see your car as "Stude of the Month" or in the "Cool Studes" section, or if you have other pictures or material that you would like to contribute to this page, please e-mail me here. I can accept either electronic or hard copy images. The Main Page is issued every other month so the next edition will be December 2012. 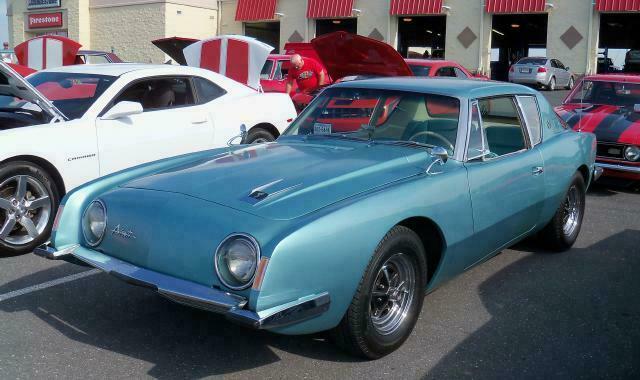 This sharp 1963 Studebaker Avanti Coupe belongs to Wayne Craig of Staunton, Virginia. Wayne's Avanti took a first in class at the Fifth Annual Food Lion Children's Miracle Network Car Show on September 8, 2012 in Fishersville, Virginia. September 8 was International Drive Your Studebaker Day and it was a good day for Studebaker as my 1964 Studebaker Wagonaire seen here roof open at the Fishersville show also took a first in class. Even with the threat of heavy rain later in the day, the show was a great success. Wayne's Avanti is an original car with approximately 32,000 miles on the odometer. It is equipped with a 289 cubic inch R1 V8 engine and Powershift automatic transmssion. Options include power steering, air conditioning, and a factory pushbutton radio. The Magnum 500 wheels were not a Studebaker factory option but they were available on the Avanti II and they look right on Wayne's car. 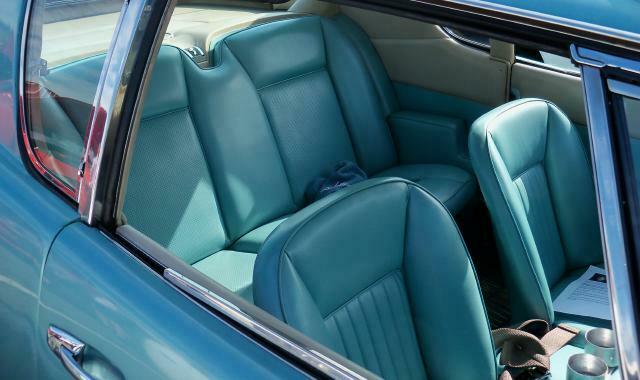 The exterior is Avanti Turquoise Metallic and the interior is Turquoise with Fawn dash and upper door and side panels. Rene van Heumen from the Netherlands sent these pictures of his 1956 Studebaker Flight Hawk Coupe. The car was originally imported to France and was subsequently imported to the Netherlands. Rene's Flight Hawk is similiar to U.S. Flight Hawks in that it is a coupe rather than a hardtop. It looks very much like Jeff Loehr's U.S.Flight Hawk that appeared on this page in August 2012. The first picture shows Rene's Hawk as purchased and the second picture shows it in its current state undergoing restoration. Flight Hawk Hardtops were not sold in the U.S. but were available in Canada and in export markets. All U.S. Flight Hawks were coupes and the coupes were available in export markets as well. Export Flight Hawk Hardtops had a higher level of trim similiar to that used on the U.S. market Sky Hawk Hardtop. An example of this would be this French Flight Hawk Hardtop owned by Gerard Chaupis that appeared on this page in October 2011 and again after a full restoration in August 2012. Thanks to Rene for sending the pictures and information about his Hawk. 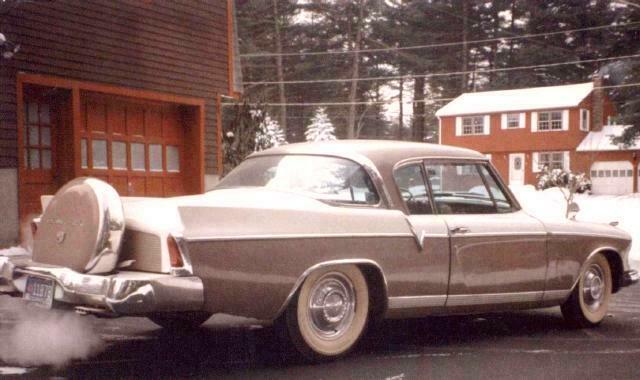 Bill Storr of Edmonton, Alberta sent in these pictures of his 1962 Gran Turismo Hawk and 1955 Packard 400 Hardtop. The picture of the two cars together was taken at a car show in August 2012. Bill's 1962 GT Hawk was Stude of the Month on this page in August 2010. Bill's Packard 400 Hardtop appeared on this page in December 2010 shortly after Bill acquired the car. 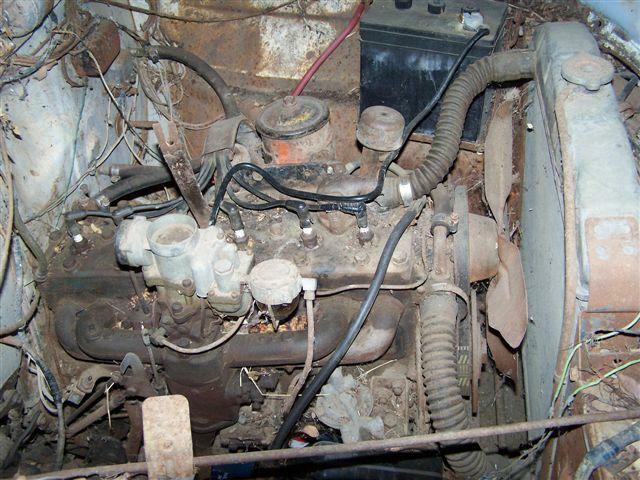 The picture above shows the Packard "after a year and hours of work out and running great." The 1955 Packard 400 was powered by basically the same 352 cubic inch Packard V8 used in the 1956 Golden Hawk. Bill Storr owns and operates Route 66 Appraisals which is located in Edmonton. His company web site profiles a number of collector cars and is well worth a visit. Thanks to Bill for sending in the latest pictures of these two fine automobiles. 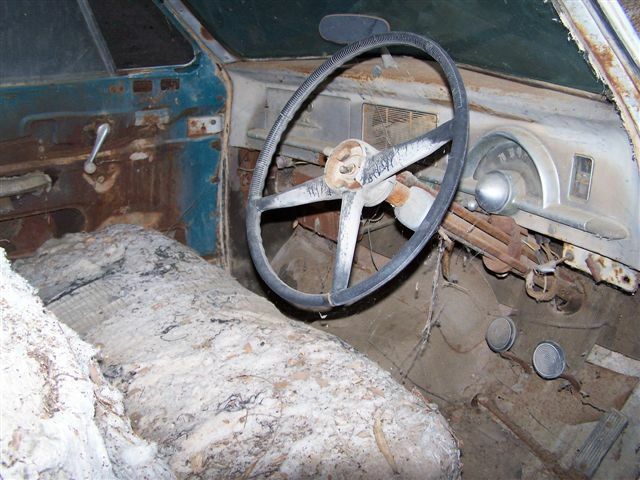 Freddie Villegas of Wildemar, California sent several pictures of an unusual right hand drive Studebaker Champion Starlight Coupe owned by his brother. The car needs a total restoration. It has California black plates that were last registered in 1965. The car appears to have a 1952 front end and a 1950 right hand drive dashboard. It is believed that the car was assembled in Canada for shipment to Australia. 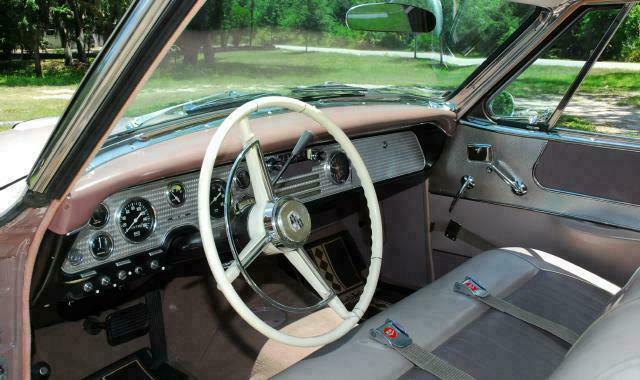 Did Studebaker retain the 1950 style dashboard for later model right hand drive cars to save on tooling cost? I don't know, but Freddie indicates that the car is as it came from the factory. Here is a picture of the engine which is equipped with a partial flow oil filter. The car also has a manual tune radio and an under dash heater in lieu of a Climatizer. 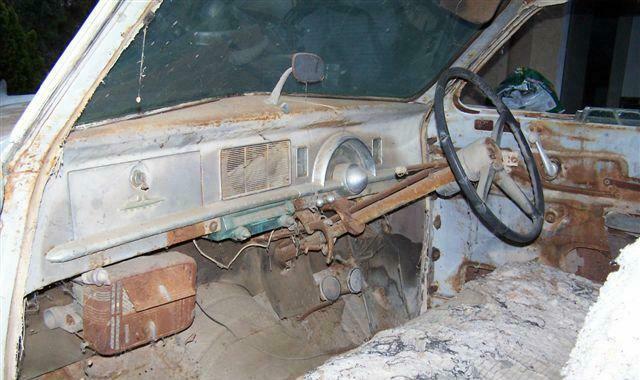 My understanding is that right hand drive Studebakers of this period did not have Climatizers and heaters if installed were the under dash type as shown. 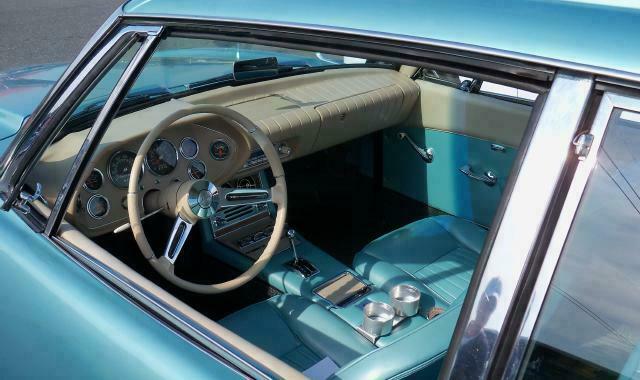 Here is another interior shot showing the 1950 style RHD dashboard. If anyone can shed further light on this car please contact me here and I will pass on the information to Freddie. Thanks to Freddie for sending the pictures and information. Peter Crisitello of Rahway, New Jersey sent several pictures from the International Drive Your Studebaker Day gathering held on September 8, 2012 at the Dover International Speedway in Dover, Delaware. Peter reports that Studebakers from six states were in attendance. Here is another view of some of the many Studes at the event. The Dover track is known as the "Monster Mile" and the Studes are parked in front of "Miles the Monster" the track's mascot. The Weasel tracked military vehicle was designed and produced by Studebaker during World War II and used a Studebaker Champion engine. 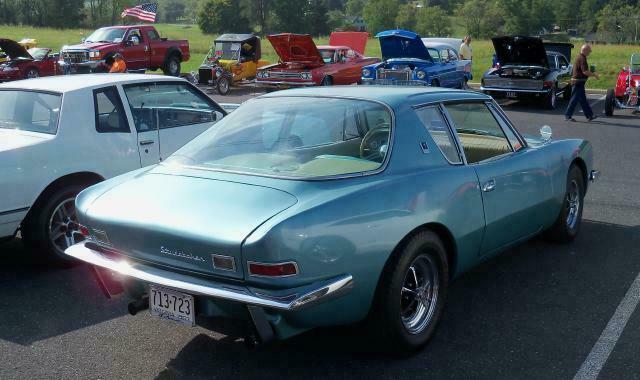 The 2014 SDC International Meet hosted by the DelMarVa Peninsula Chapter of The Studebaker Drivers Club will be held at the Speedway and at the Dover Downs Hotel and Casino on June 28 through July 5, 2014. This sounds like a great location for the meet. Peter's 1947 Commander Business Coupe was Stude of the Month on this page in February 2011. He also owns a very nice 1967 Avanti II that appeared on this page in December 2010. Thanks to Peter for sending the pictures and information. Johnny Lightning is best known to Studebaker toy collectors for its 1:64 scale models of the Studebaker Champ Pickup, Studebaker Avanti, 1957 Golden Hawk, and Custom Frankenstude. Less well known is Johnny Lightning's 1:24 scale 1951 Studebaker Commander Starlight Coupe. This is a very heavy model for its size. The front wheels turn and the hood opens but the doors and trunk are cast closed. Here is a view with the hood up that shows the nicely detailed V8 engine albeit painted in an incorrect blue color. The whitewalls on this example are are too narrow and the curved rear window lacks dividing strips. On the plus side, the hood emblem and hood ornament are nicely done and the outside rear view mirror appears to be correct. The solid color interior is accurate but is difficult to see given that the doors do not open. I purchased this example at a Walmart some time ago, but I have not seen any in stores of late. There are a number of variations of this model. Some have wider whitewall tires and some have blackwall tires. All come packed in a window box. Here is the black version in one style of window box. In addition to black, this model was issued in red, light blue, light green, and pearl white, the latter being a special "White Lightning" edition. Coca-Cola promotional versions were issued in yellow and in red. I purchased the black model pictured above at a Walmart some time back but I have not seen any of the variations in stores of late. Most versions appear on eBay from time to time and typically sell for between $15 and $30. The special pearl white version can bring as much as $60.